The boycott move comes amid weekly protests by thousands of people that began in December and have spread from the capital Belgrade to a dozen other towns and cities. 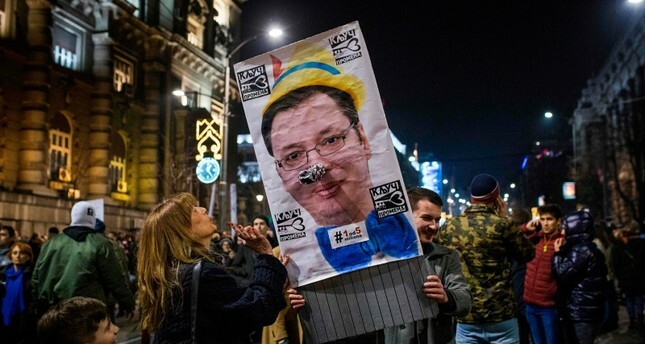 The protesters and opposition are also demanding Vucic's resignation and snap elections. "We are boycotting the parliament not because... they (the ruling coalition) disrespect us but because we have an obligation to the thousands who are protesting ... to demand a normal system and a normal Serbia," Sanda Raskovic Ivic, head of the centre-right Democratic Party of Serbia, told reporters. Ivic's party belongs to the Alliance for Serbia, a heterogeneous grouping of political parties, trade unions and civic groups. Vucic, a nationalist firebrand during the Balkan wars of the 1990s who has become an advocate of closer ties with the West, has said he will not bow to the protesters' demands. The opposition's boycott decision will not halt the work of parliament, where the SNS and its Socialist Party ally hold 160 of the 250 seats, a comfortable majority, but it could undermine the ruling coalition's credibility.